by PJ Yerman What an interesting time for Hollywood! In an era where nothing makes money but sequels, remakes and superhero flicks, it’s refreshing to see an original western film take the top spot at the box office. What? The Magnificent Seven is a remake? It’s a remake of a remake? Well never mind then. This latest iteration of the samurai epic-turned-’60s western-turned-modern blockbuster is directed by Antoine Fuqua (Training Day, Southpaw) and stars Denzel Washington, Chris Pratt, Ethan Hawke, Vincent D’Onofrio, and Peter Sarsgaard among others. It tells the story of seven gun-toting outlaws in the old west who are hired by a woman to defend her town from trigger-happy thieves and avenge her husband’s murder. Action, explosions, and flying bullets ensue. As much as I’d like to compare this film to it’s two non-canonical predecessors, I’m going to avoid that and instead judge this film as one should any other film — on it’s own merits. First, I want to address the pros, of which there are quite a few. What’s most impressive is the commitment of the actors to their roles, despite only three of the seven outlaws having compelling personal stakes (more on that later). In addition to Denzel bringing his expected A-game, Pratt and Hawke are without a doubt the standouts of the film. Pratt simply oozes charisma. He spends most of the movie convincing you that he’s a drunk with a smirk on his face until you realize he’s been pointing a gun under the table, ready to pull the trigger at a moment’s notice — he balances charm and killer instinct well. Hawke’s character, arguably the most interesting of the group, has a troubled past that hinders his ability to shoot any firearms. These character flaws register through Hawke’s facial expressions and his pained, stoic manner of reacting to the mayhem around him. It’s subtle tricks like these that he usually only reserves for his work in Richard Linklater films (like in the Before trilogy), but he uses them to great effect in The Magnificent Seven. The other members of the gang all have their standout moments and are enjoyable enough to watch when on screen, but the shallowness of their characters makes it tough to empathize with them. They’re all badass, but they’re badass for the sake of being badass. Speaking of badass, another enjoyable facet of the film is the action. Serving as the basis for it’s marketing, the action set-pieces — namely the shootout in the second act climax and the town-wide battle in the third — make The Magnificent Seven worth the price of admission. Fuqua uses wide, sweeping shots of the desert landscapes and always keeps the action in frame, whereas lesser directors might shake the camera or stick to close-ups to hide stunt doubles or bad choreography. The explosions ring in your ears, the bang of the guns gives you a shot of adrenaline, and it all works to the advantage of the film’s atmosphere. Where this movie fails to deliver, however, is in its painfully generic plot, the unmotivated villain, and a tendency to slip into mindless tentpole spectacle. The lack of character depth is disappointing considering who’s behind the script. The film is co-written by Nic Pizzolatto, creator of the hit TV series True Detective, and seeing as the first season of that show is one of my favorite seasons of television ever, I had pretty high expectations for what Pizzolatto could bring to the table. Unfortunately, this is a plot you’ve seen a thousand times (and not just because it’s a remake), something that doesn’t help when the film already relies too heavily on its tired plot and does little to set up character motives going into the big action scenes. No tropes are subverted, no clever misdirections are played up, and you can see the character arcs coming from a mile away. The villain, played by Sarsgaard, may be the the most thinly written character I’ve seen all year. His reasoning for the decimation of this western town is barely explored and we as the audience are not expected to think too hard about it. It’s better you just turn your brain off and watch Chris Pratt twirl his revolver and shoot barrels filled with explosives. 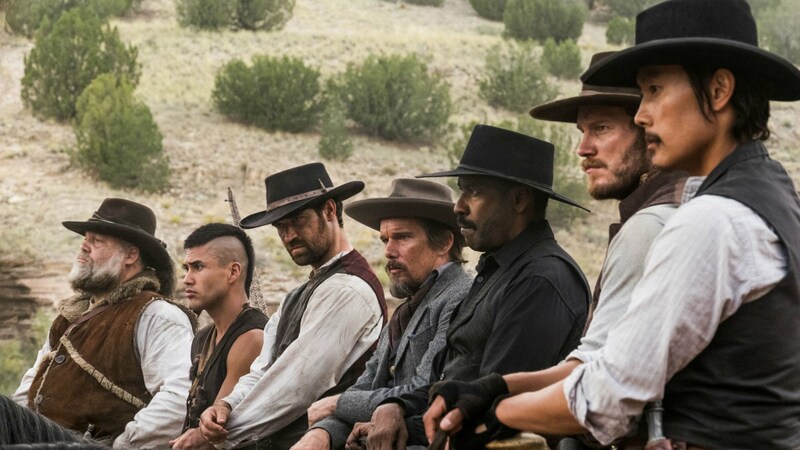 While The Magnificent Seven doesn’t make much of an effort to pull at your heartstrings or your brain cells, it’s still a fun modern take on the western genre that boasts charismatic performances and solid action.